I am just THRILLED beyond words to have recently learned one of my paintings, “Apple of My Eye”, in the “Small Works-Fruition” exhibit at the Copley Society of Art has earned an Award of Merit!! Chosen by the Copley Society art committee, exceptional pieces in the small works show are recognized with awards of merit. These awards are based on the professionalism of presentation, technique, composition and style. The awards of merit are beneficial to artists seeking advancement within the ranks of the Copley Society. Did I say how excited I am about this? There’s something to put in my “good news” jar for 2019!! 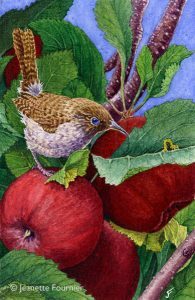 This entry was posted in Exhibitions, Finished Art Work and tagged art exhibit, bird art, carolina wren, Copley Society of Art, NH Artist, songbirds, watercolor art, white mountain artist. Bookmark the permalink.